← Kendall Grey’s Hot Blooded Cover Reveal! The wines I’m featuring today are slightly more expensive than my usual under $10 bottles, but since this time of year there are lots of parties (graduations, wedding showers, oh-hell-they’re-out-of-school-where’s-the-wine neighborhood gatherings, etc), a slightly more upscale wine might just be the right ticket. Or, heck, treat yourself; it’s the weekend. On the Label: “Our Kendall Jackson AVANT Chardonnay is crafted in a modern style that delivers a fresh expression of this exceptional grape. This wine is cold-fermented to retain crisp green apple and lemon drop flavors; the resulting wine is sleek and lively, providing a superb affinity for food. My Take: Well, once again if I’d read the label I wouldn’t have bought the wine. Green apple and lemon drop in the same sentence makes me think of hard candy, or perhaps flavored vodka. Wine is the very last thing that comes to mind. However, this is a nice wine – not, to my taste buds, noticeably a Chardonnay, but a clean and crisp white that goes great with seafoods or light pasta dishes, charcuterie, cheeses, etc. I have to say, while I might not be a fan of KJ’s labels, I am a fan of their wines! My Rating: ~ Very Drinkable ~ Plus it has a screw top, and I’m all for easy-open bottles. My Take: Any label that uses the word “unique” more than once needs to have the label re-done. That aside, this is a nice, big wine with a lovely mouthfeel. Great, once again, with food; spicy Mexican, zesty ribs, or a really well-cooked steak. My Rating: ~ Very Drinkable ~ especially at the sale price. 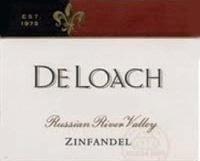 I just checked DeLoach Vineyards web page, and it doesn’t look like they’re selling any RRV Zin right now – so if you see it in your store, grab it. What wines are you drinking? I’d love to know! This entry was posted in Wine Friday and tagged Avant, chardonnay, Christine Ashworth, DeLoach Vineyards, Kendall-Jackson, Wine Fridays, Zinfandel. Bookmark the permalink. Thanks for the recommendations. And I’m with you on the screw tops. Sometimes I opt for Pinot Noir instead of Cab simply for the easy access!